Atmosic Technologies has launched "the industry's lowest power wireless Bluetooth 5 platforms". 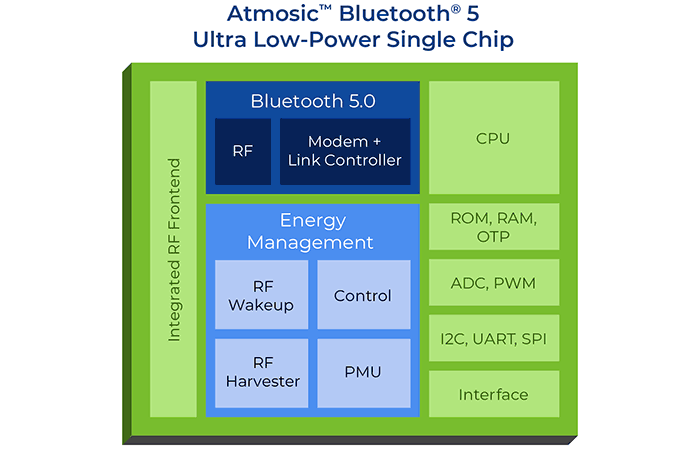 In a nutshell, Atmosic has pulled off a pincer movement on the Bluetooth 5 chip state-of-play by redesigning such a chip from the ground up to use less energy and pairing it with an RF energy harvesting component. 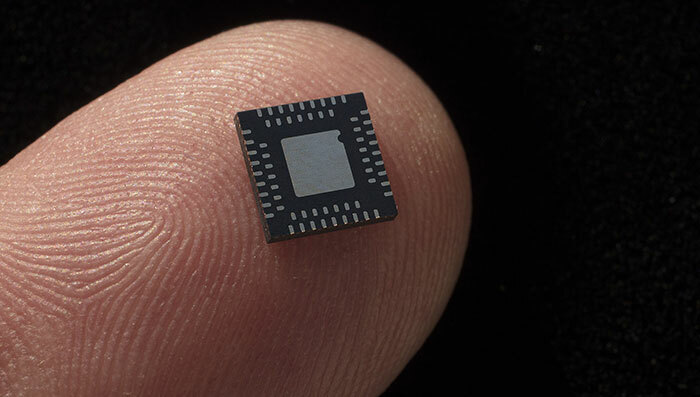 Thus, its new M3 series ultra-low-power wireless Internet of Things (IoT) Bluetooth 5 chips are designed to deliver "forever battery life" to billions of connected devices. The startup company is led by a team of Atheros engineers and founders, and has backing and support of major tech players. "If you hate changing batteries, you're going to like the technologies we're developing to help eliminate that problem," said John Hennessy, an advisor to Atmosic and chairman of the Board of Alphabet (Google). At the origin of its project, Atmosic decided to attempt to radically reduce battery dependence for IoT. In order to do this Atmosic worked on making the Bluetooth 5 chips much less power thirsty by working on two initiatives; Lowest Power Radio, On-demand Wake-up. This design inititive resulted in from 10 to 100 times lower power utilisation. That was low enough to make Controlled Energy Harvesting practical to fully power the solution as a whole. Analysts predict that the installed base for Bluetooth, Wi-Fi and NFC connected devices will be more than 35 billion worldwide by 2023. Battery dependence could limit the potential of IoT and could be a "groundbreaking" innovation reckons David Su, CEO of Atmosic. The Atmosic M2 Series Bluetooth 5 SoC features Lowest Power Radio delivering 5 to 10 times lower power; the addition of On-demand Wake-up reduces the power by 10 to 100 times. The Atmosic M3 Series Bluetooth 5 SoC has the additional feature of Controlled Energy Harvesting to provide forever battery life or eliminate the need for battery power. The M2 and M3 Series offer multiple application options for wearables, personal and asset trackers, beacons, remotes, keyboards, mice, and more. Packaging options for the M2 and M3 Series include flash and non-flash, 5x5 QFN, and 6x6 DRQFN packages. M2 and M3 solutions are sampling with customers now, ahead of volume production which is expected to begin in Q2 next year. And Intel announces that it will end 5G smartphone chip development. I am interested in how this can be used for things like wearables, trackers, etc. If you had one of these fully sealed and tamperproof, they might even have some security applications. skimmed the read, presume by RF it means specifically the bluetooth RF signal, so can not be a host, only client to something? Clever to be able to harvest enough energy from the data that its processing though. There were radar powered bugs back in the days of the Soviet Union. In order to make the bug passive and undetectable it would be totally inert until a radar beam was directed at it, when it would harvest the power and begin transmitting. I doubt this would be able to function on a normal bluetooth signal but it's quite possible it could work with beam forming and a highish transmit power. We are awash in WiFi energy in the same band, I expect most of the energy will come from there. It won't know or care. Exactly… a decent enough battery cell would enable years of life!